Bryant received All-Atlantic Coast Conference recognition in both football and baseball in college. He was chosen by the Vikings in the seventh round of the 1967 NFL draft but, due to the effects of a lingering knee injury suffered during his senior year at South Carolina, appeared in only one preseason game and missed all of the ’67 regular season. He was a reserve in the defensive backfield in 1968, intercepting two passes and returning one for a TD, and also returned kicks. Bryant moved into the starting lineup at right cornerback in ’69 and was outstanding, intercepting 8 passes, until sidelined by a knee injury. He continued to perform well in injury-shortened seasons in 1970 and ’71 and, through 1972, had intercepted 20 passes. Vikings went 12-2 to finish first in the NFC Central while leading the conference in fewest points allowed (168). Won NFC Divisional playoff over Washington Redskins (27-20) and NFC Championship over Dallas Cowboys (27-10). Lost Super Bowl to Miami Dolphins (24-7). Bryant missed virtually all of the 1974 season due to injury but bounced back in ’75 to intercept six passes. Called “Bones” for his slight build, Bryant was a key playmaker in the defensive backfield when healthy despite his lack of size and ideal speed. 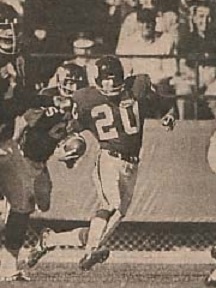 He was selected to the Pro Bowl in both 1975 and ’76 and had an especially noteworthy performance in the NFC Championship game against the Rams in 1976 when he returned a blocked field goal attempt 90 yards for a touchdown and intercepted two passes. Bryant played a total of 13 seasons, all with the Vikings, appearing in 161 regular season games and 14 more in the postseason. He intercepted 51 passes, three of which he returned for TDs, and had another six interceptions in the playoffs. Bryant was a consensus second-team All-NFL selection once, received second-team honors from UPI after one other season, and was named to two Pro Bowls.